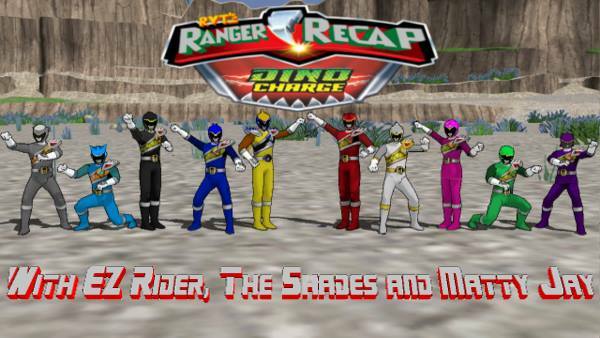 We meet the rest of the Dino Charge crew… and witness the beginning stages of a potential Shelby/Dr. Morgan catfight! this episode was good and Keeper is a jerk to the rangers. I mean really leave them after talking to his “old friend Sludge” and just leaving them was not cool. Those Tyler’s weapon look like the Tyrano Staff and the lion fang if they did the fusion dance? It isn’t me that see that? Anyway The Megazord was good and the fight was good. Less talk more action like I always say. So I’m going to say that the Enegems are one the most powerful gems in ranger history only rank up from the Dino Gems and on par with the Zeo Crystal and those thing that would not be name in OOD. Dino Charge is a million times better then Megaforce and Samurai is somewhat a glitz pleasure of mine. ALSO THANK ZORDON THEY DON’T USE GO GO DINO CHARGE OR I WOULD HAVE SAID DAME IT GOSEI! Also is Gosei in the morpher? Do you guys like Toqgers ending? So epidsode 3, we find out that the enegems are like the fountain of youth. Though I do wonder what would happen if they no longer have the enegems around them. We also see the rangers meet Sledge for the first time, and we got to see the first apperience of the Dino Charge Megazord Tri-stegga mode. I like that they made the cockpit of the megazord original and looks pretty good. This is the second time they made the cockpit of the megazord original except here they don’t have to use bulky armoured shoulder pads like in Samurai. So overall, another good episode and I hope they keep up the good work. Now for a question. While we don’t know for sure if Toqger will be the next senti to be adpated what Power Ranger title would like them to call it if Toqger does get adpated? For me I like the name Power Rangers Engine Rush. Is it just me, or am I seeing *GASP* more original footage being made for the show?! From the Megazord cockpit to seeing the Rangers getting their asses handed to them By Sledge and his goons! I think we’re going to be alright here! And some little things that I liked as well, such as Sledge’s shoulder-jump packs, Tyler going after Fury cause the villains were up to something, which segways to Sledge’s plan of looking for the Command Center, in the THIRD EPISODE! Tzachor, this is what competence looks like! Now this may have been asked, but I’ll ask anyway: What Toku toy do you want to add to your collection? Me: Legacy Saba! Come on, who doesn’t want it? And speaking of collections: remember when you guys looked at my pic and saw what I had?! Well, I’m sending you guys this cause, besides bragging rights, I thought you might want to see what was behind me! And to let you 3 know, this is only one-eighth of what I got! ENJOY! And I approve of this message! !